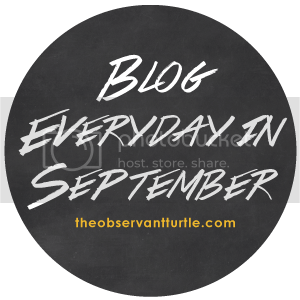 Today’s prompt for “Blog Everyday in September” is to reintroduce myself to my readers. Easy enough, right? Those are the absolute basics! But how about the stuff you wouldn’t be able to find in a file? -I absolutely love to write. It’s something that I’ve been doing for a really long time. In fact, I wrote my first story when I was four years old. It was about a leprechaun that took me to Toys ‘R’ Us. Priorities, obviously. -Even though I can’t play any instruments, music has always been a huge passion of mine. I listen to every single genre (seriously, quiz me) and enjoy all of it. I work in non-profit performing arts and it’s something I discovered a passion for back in college. I have my “dream job” currently and I seriously wonder on a daily basis how I got to do something so awesome. -Quite contrary to the above comment, I also have a pretty big interest in fashion. I’m terrible at picking outfits but I love trying new trends. I’m slowly getting there! But even as much as I love fashion, I still love wearing yoga pants and a t-shirt the majority of the time. -I started blogging in 2011 right after I got married. I really wanted to blog about southern culture, but it quickly became more of a journal and really helped me with the move to Texas. I’ve met so many good friends through blogging and I don’t know what I would do without them! If you blogged today, link up below! Doesn’t mean you had to follow the prompt. It could be about anything! I just ask that you include the button or mention the linkup in some way in your post. Blogging Bites. Let's Fix It.